On International Women’s Day over the last couple of years, Benevity has made an effort to be intentional about recognizing the importance of gender equality, both at our company and in the broader community. As a small gesture in the direction of impelling action toward positive change, we will be matching donations on a 1-to-1 basis up to $50,000 to three local organizations that are making meaningful efforts to address some of the unique challenges facing women: YWCA Calgary, Canada Learning Code and the Women's Centre of Calgary. Each of the three charitable organizations were selected for inclusion in the 100% matching campaign for motives as unique as the organizations themselves. Together, they empower women to achieve economic independence and represent important steps in the required diversification of our economy and the pursuit of real gender equality. YW Calgary is the largest and longest serving women’s organization in Calgary. For over 100 years, they’ve remained fiercely focused on enhancing women’s safety and well-being while advocating for equity. To celebrate International Women’s Day, YW is raising funds to support women in developing and gaining essential skills such as job search techniques, resume writing and networking through YW’s Employment Resource Centre. Their goal is to support women to establish and maintain employment and to create a learning environment that successfully bolsters their capacity for sufficiency and success. In the case of Canada Learning Code (recently renamed from Ladies Learning Code), the advancement of digital literacy and the enablement of career choices involving technology are of critical importance to all Canadians, but especially women; these efforts are also particularly vital steps in the required diversification of our economy, the skill sets likely to be in high demand in the future and the pursuit of real gender equality. And last but not least, the Women's Centre of Calgary, who will be applying funds raised this International Women's Day towards their Women Lead YYC program that supports women who want to lead, influence or participate in collective action in order to improve their community. This program explores mindsets, leadership approaches and communication strategies that boost the chances of successfully influencing change. As we gear up to #BalanceforBetter this International Women’s Day, we hope that our collective contributions will help the women of our country and our community access the support they need and become empowered and take up their rightful place in our society and in our workplaces. Every year we make incremental progress, but with your support, we can go further. 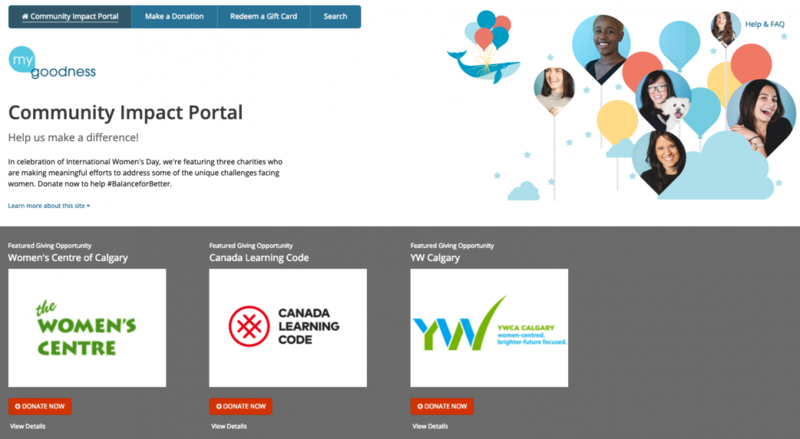 Donate to YW Calgary, Canada Learning Code and the Women's Centre of Calgary through the Benevity Community Impact Portal until March 12, 2019 and get a 100% match that will double your impact!